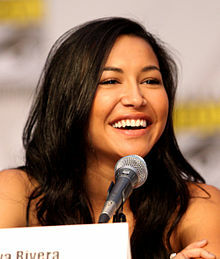 Naya Marie Rivera (born January 12, 1987) is an American actress and singer. She is known for her role as Santana Lopez on the Fox television series Glee (2009–2015). Rivera was signed to Columbia Records as a solo artist in 2011 and released a single in 2013, "Sorry", featuring rapper Big Sean. In late November 2017, Rivera was arrested and charged in Kanawha County, West Virginia with domestic battery against her future ex-husband Dorsey after she allegedly hit him in the head and face. In January 2018, the domestic battery charge was dismissed at the request of Dorsey. ↑ "Naya Rivera Bio". Us Weekly. Archived from the original on April 19, 2016. Retrieved October 7, 2013. ↑ "Naya Rivera Dishes On Recording "Sorry" Single With Big Sean". Billboard. Retrieved January 22, 2014. ↑ "Naya Rivera Arrested for Domestic Battery in West Virginia". E! Online. Retrieved December 12, 2017. ↑ "Naya Rivera's Domestic Battery Charge Has Been Dismissed". PEOPLE.com. Retrieved 2018-01-18. This page was last changed on 7 April 2019, at 11:50.